Margaret Addaline Hanshaw1,2,3,4 [Addie Hanshaw5]. 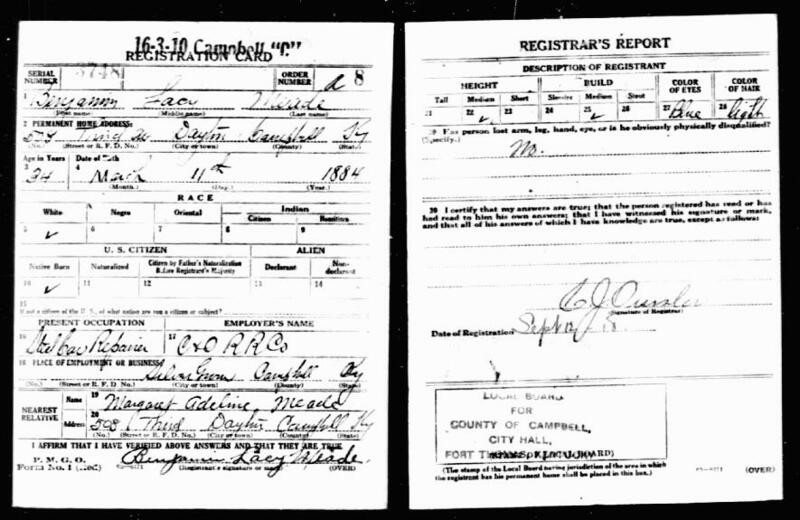 Born Apr 28 1892, Lawrence County, Ohio.3,4,6,7,8 Addie was apparently a twin of brother G.W..
Meade, Lacy B., head-of-household, age 26, born in Kentucky; parents born in Kentucky; first marriage, married 0 years; occupation: farmer, general farm; rented farm. Meade, Margaret A., wife, age 18, born in Ohio; parents born in Ohio; first marriage, married 0 years; no children. Rose, Wellington, boarder, Indian, age 79, born in North Carolina; father born in Virginia; mother born in Florida; widow; occupation: "own income". Mead, Benjamin L., head-of-household, age 35, born in Kentucky; parents born in Ohio; rented home; occupation: car r[..unclear..], railroad. Mead, Margaret A., wife, age 27, born in Ohio; parents born in Ohio. Mead, Lionel [unclear], son, age 7, born in Ohio; father born in Kentucky; mother born in Ohio; attended school. Mead, Thelma J., daughter, age 3 [unclear] years 11 months, born in Ohio; father born in Kentucky; mother born in Ohio. Elmore, Eva H., sister, age 16, born in Ohio; father born in West Virginia; mother born in Ohio; single. Meade, Benjamin L., head-of-household, age 46, born in Kentucky; parents born in Ohio; first married at age 25; rented home ($6 rent); no radio in home; occupation: laborer, lumber; not a war veteran. Meade, Margeret L., wife, age 37, born in Ohio; parents born in Ohio; first married at age 17. Meade, Lionel A., son, age 17, born in Ohio; father born in Kentucky; mother born in Ohio; attended school. Meade, Thelma, daughter, age 14, born in Ohio; father born in Kentucky; mother born in Ohio; attended school. Meade, Beula E., daughter, age 8, born in Washington; father born in Kentucky; mother born in Ohio; attended school. Meade, Vivian M., daughter, age 3, born in Washington; father born in Kentucky; mother born in Ohio. Meade, Benjamin Jr., son, age 3, born in Washington; father born in Kentucky; mother born in Ohio. Benjamin's obituary was published in the "Chehalis Bee-Nugget" (Chehalis, Washington) on Friday, August 30, 193510 (see scan below). RootsWeb WorldConnect data by Jean Burda (). RootsWeb WorldConnect data by Dawn Williams (). 1910 census, Clay Township, Gallia County, Ohio; roll T624-1184, ED 28, page 36B, line #90, dwelling #107, family #113. 1920 census, Dayton, Campbell County, Kentucky; roll T625-564, ED 48, page 3B, line #37, dwelling #49, family #50. Contribution from Thomas E. Cox citing: Bonnie Faye (Hanshaw) Cox. 1930 census, Milan, Spokane County, Washington; roll T626-2514, ED 145, page 1A, line #1, dwelling #1, family #1. 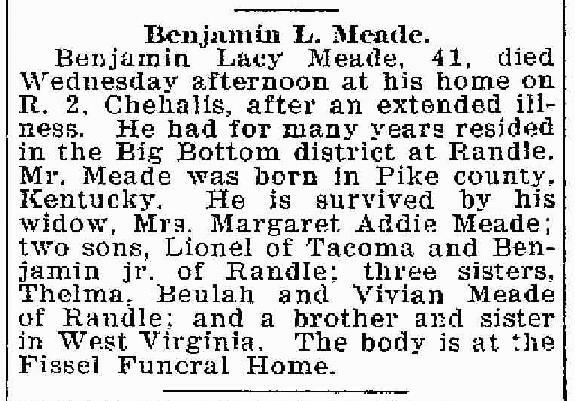 Obituary of Benjamin Lacy Meade; "Chehalis Bee-Nugget", Aug 30 1935; http://www.ancestry.com. RootsWeb WorldConnect data by Mena ().